In 2015, we journeyed across about two-thirds of the country, and found that we loved doing the Junior Ranger programs at National Park sites. Each site -- Park, Memorial, Monument, etc. -- has a program geared for children through middle elementary school (though plenty of adults like to do the programs as well). This year, as I simultaneously planned our 34-park cross-country itinierary and the boys' school year programs, I realized that instead of a textbook-based program, we were going to do a park-based history program. Something we've discovered is that it can be very overwhelming to take everything in when visiting a National Park site. There's the history of the park itself, the theme/person the park is based on, geography, architecture...where to begin? 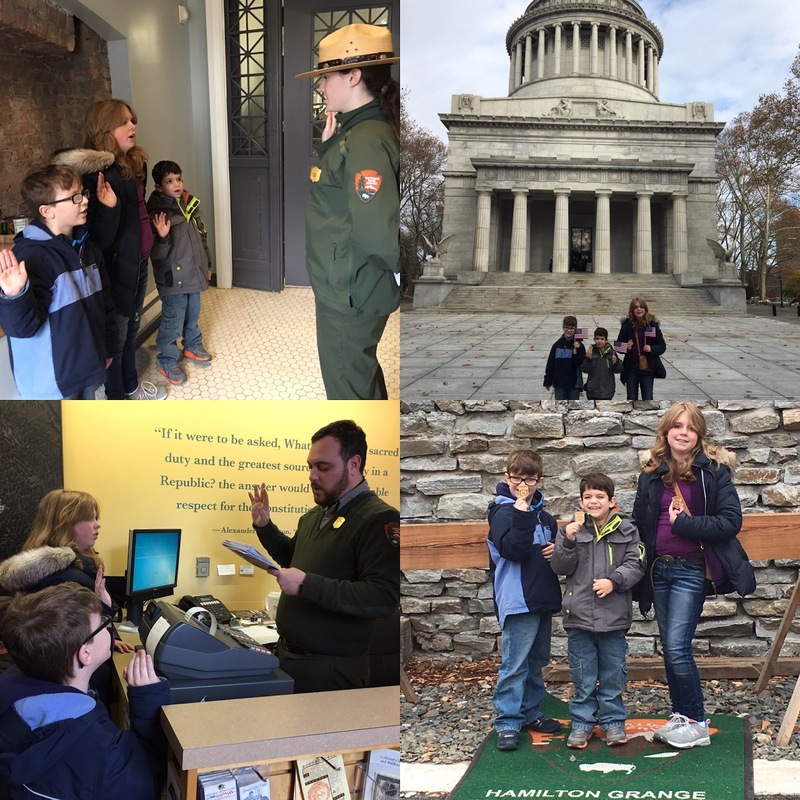 We also discovered the Junior Ranger program highlights important parts of a venue, giving an overview with enough details to learn, but not so many that young brains get frustrated and shut down. Most programs are also cross-curricular: for example, a visit to the General Grant Memorial features activities not just about the man buried there (President Grant), but also architectural features of the mausoleum, while the Ranger guide to Yellowstone Park addresses the history of the park, the geology of the caldera, and even the animals that live there. Even creative writing becomes fair game! Included are individual activities, such as word searches or mazes, while other pages can became group projects. Some of the more difficult activities that were divided among the scholars; one would work on a page while another did something different, and they'd share answers. Many of the questions can be answered by carefully looking in visitor center museums or along trails, but often there are "Interview a Ranger" options. At first, Jude was very shy, and only would go up to the Rangers with his book when he learned that it was "Ask the Ranger, or you can't earn your badge," but after a few interviews he became more comfortable with the idea of asking perfect strangers about their jobs. We found the Rangers to be extremely kind and patient, as well as knowlegeable about their assignments. We even found a few Rangers that became real-life Park Rangers because they had been Junior Rangers! 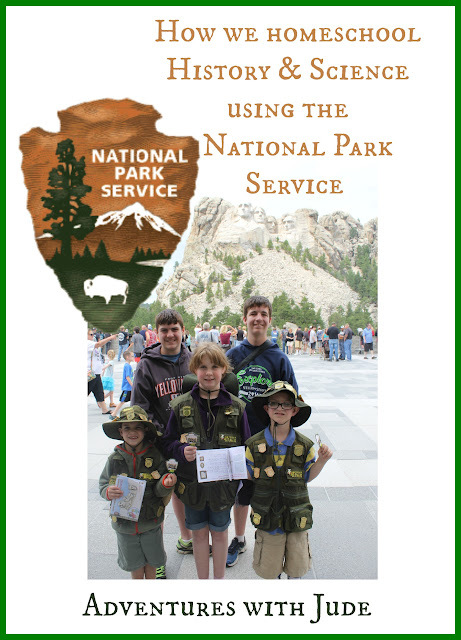 Junior Ranger badges are earned. They aren't given out just for showing up. Rangers check books for completion -- and some will even ask questions about what Rangers should know. On our trip this summer, Celia, Jude, and Damien filled their ranger hats and vests with badges, and someone asked about how they could get them. Jude piped up, "They're hard work! You have to answer the questions and everything!" From site-specific badges to topical ones like Paleontology and NPS History, these programs provide serious learning, not just a souvenir of the trip. The National Park Service also helps preserve "hidden" stories. 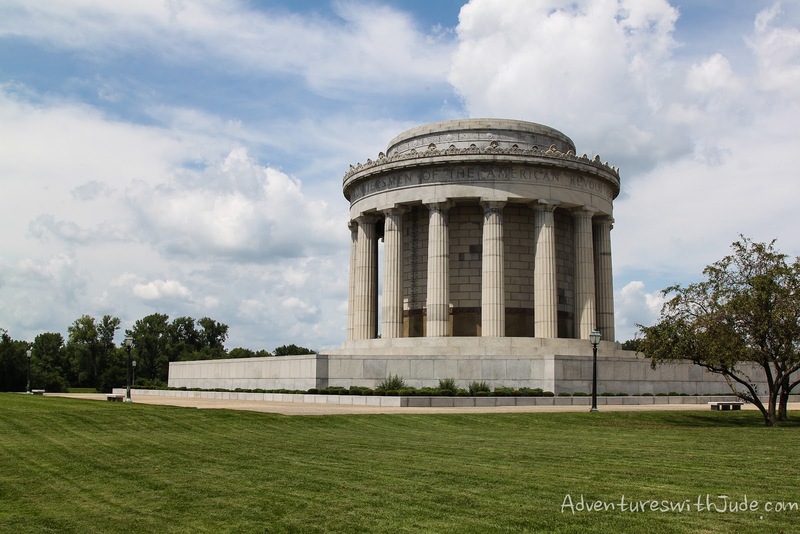 Have you ever heard of George Rogers Clark? You've probably heard of his baby brother's cross-country expedition -- he would be the William Clark of "Lewis and Clark" and the Louisiana Purchase Expedition. However, until we visited here, I had never heard of George. The George Rogers Clark National Historical Park is in Vincennes, Indiana. It was here that Clark, leading a small band of frontiersmen, secured Fort Sackville from the British and earned the support of the local Native tribes. Sadly, his efforts have been generally omitted from history books, but if it wasn't for the eldest Clark's efforts on the western frontier during the Revolutionary War, there would have been no United States to expand westward! Though all ages are welcome to participate, the official Junior Ranger program is for students generally ages 6 to 13 (elementary through middle school). However, we have also discovered a way for high-schooler Matthew to get more from his experiences in the parks. While he didn't earn any badges himself on our recent outings, he often paired up and helped Damien, or would scout ahead to find where an answer could be found and lead the boys to the right section of the park. We also found an offering from The Great Courses, entitled Wonders of the National Parks: A Geology of North America. 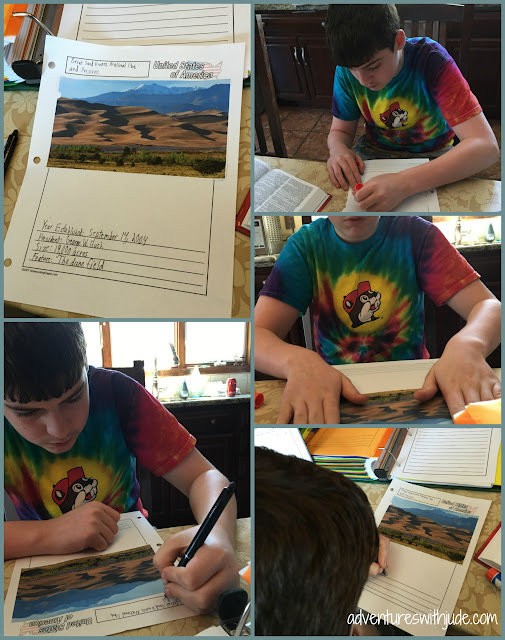 This course made a great spine for a study in the National Parks system, allowing Matthew to study the geology of all the National Parks. 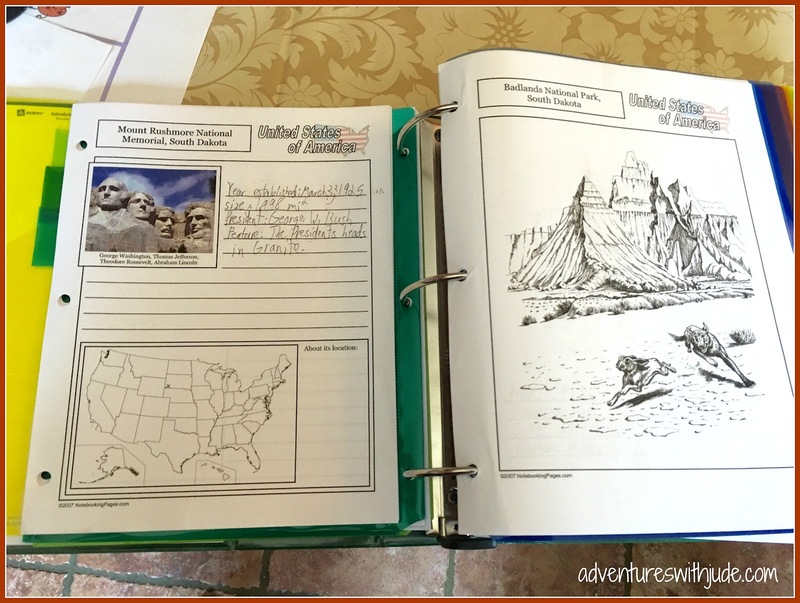 We've combined the video program with a notebooking program (we're using the one we reviewed from NotebookingPages.com), reasearch, and essay writing to integrate our visits to the National Monuments, Memorials, and Historical Sites and create a two-credit high school program (science and social studies). As a parent, I've also have had some great surprises. At Malpais National Monument, one of the activities was to find the logo for the Continental Divide Trail. This is the Rocky Mountain counterpart to the eastern Appalachian Trail. We didn't realize this was even along our route! Of course, we decided that we needed to hike a bit of it -- it was there, and we had hiked several sections of the AT in the past, so why not a few miles on the CDT? I also pushed myself well beyond my comfort zone several times visiting parks, including driving the steep, switchback laden Old Fall River Road in Rocky Mountain National Park. I have to say it was worth it - we saw things we would never have otherwise had the opportunity to view. Sure, we learned about the flora and fauna of the area with our Junior Ranger books, but there was a definite feeling of accomplishment for all of us when we reached the top and knowing we didn't take the "easy" way. The NPS leads the way in preserving these areas, as well as even older "roads" like the Oregon Trail. Want to experience a pioneer's life, if only for a few moments? Walk uphill on a midsummer's day on the trail at Scott's Bluff. We were very grateful to have an air-conditioned car to return to! One of the best things about National Parks is the affordability. Yes, we had traveling expenses, but entrance fees are either nonexistant or extremely low. Recently, we visited New York City for a short vacation, and visited four sites without leaving Manhattan. We had two afternoons and a full day of activity that cost us nothing -- when you consider how expensive activities for seven in New York can be, this was a nice perk! I think there is no better way to learn about something than to immerse yourself in it, and the National Park system makes this style of learning not only possible, but relatively simple. It's easy to read and explain Jim Crow laws, but there's a much larger impact when standing in a hallway at the Brown vs. Board of Education NHS that includes signs for where which student is permitted to go. Riding in a boat through New York Harbor and approaching the Statue of Liberty gives a small idea of what immigrants may have felt when arriving in the United States. Of course, there's nothing quite like watching Old Faithful erupt or a bison eat his dinner with your own eyes! It's also emotional to experience the highs and lows of the country where they happened: the hope written in the declaration that was written in Philadelphia in the halls of Independence National Park and the gut-wrenching tragedy where Flight 93 crashed in the Allegheny Mountains on September 11, 2001. There is at least one National Park site in every US state and territory, giving everyone a chance to explore! Even if you choose just to visit the sites of the National Park Service as a one-day field trip, I highly recommend taking the opportunity!